The boy was about fifteen years old when he died. He had been born in Europe and traveled to America shortly before he died. He likely died as a result of violence. Oh, and he was someone none of us ever knew or met because he lived and died 400 years ago in the colony of Jamestown. So how do we know anything about who he was or how he died? 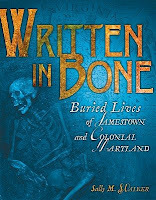 Written in Bone tells the story of scientists and historians who excavated graves at Jamestown and in Maryland and studied the remains to find out all they could about these early colonists. With beautiful and informative photos, Sally M. Walker writes in incredible detail about the tests and research that scientists do to find out about early settlers from their remains. Did you know that you can usually tell a male and female apart by their bones? Or that you might find out where a person grew up by studying isotopes in their tooth enamel? The book's compelling enough to be recreational reading, but Ms. Walker also includes tons of source notes and resources for further research, so this is a great choice for reports, too. Live in or visiting Washington DC? You can check out the Written in Bone exhibit at the Smithsonian Natural History Museum, too. I'm going to DC at some point this year (in October for a wedding if not before) and I am definitely going to visit this exhibit! So, so many different techniques are used by forensic anthropologists to research human remains and Written in Bone presents many of them in an interesting and accessible format. Color photographs show the remains that were excavated and how scientists studied the bones to determine who these people were and what might have happened to them. What would your bones say about you?